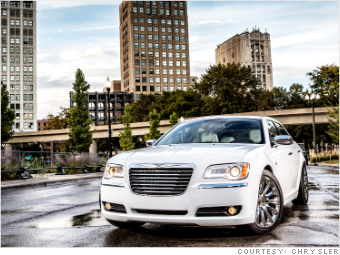 While the Impala is this year's standout, the Chrysler 300 is the car that originally turned up the heat. Before 2005, industry sources say, exterior design wasn't a major consideration factor among people shopping for full-sized cars. After 2005, it was. Now, let's see, what happened in 2005 that would have made car shoppers think about design? Oh, that was the Chrysler 300's first model year! With a grill that announced its approach from miles down the road, the 300 had presence to spare. And, with an available Hemi V8, it had the power to match. As Chrysler suffered through its bad marriage with Mercedes-Benz this car was one of the few bright spots. More recently, as the company struggled for its survival, the 300 had started to fall behind a bit. But the redesigned version, released in 2011 has brought it back. Like the others, it's a big, comfortable car but with an overt emphasis on performance that sets it apart. Of course, that available V8 does cost you in gas. The V6 engine, teamed with a smooth eight-speed transmission, offers very good performance with better fuel economy.